DO NOT BE AFRAID TO MOVE---If fish are not biting in one place, don't be afraid to move to another. One of Reelfoot's unique characteristics is that it offers so many varied kinds of fishing from 18' water to the shallows and heavy timber. Chances are the fish will be biting somewhere, no matter what the weather. WATCH THE WEATHER---Reelfoot may be a relatively shallow lake and small in comparison to some bodies of water but it has delta flatland on three sides and storms can and do blow up in a hurry. Do not challenge the lake when a sudden storm strikes. Waves of three to four feet can spring up in only a few minutes. Best places for shelter include the islands, ditches and duck blinds. A note of caution on the duck blinds-they are favorite summer retreats for some of Reelfoot's meanest residents. Although many of the snakes at Reelfoot Lake are not poisonous, cottonmouths are, can and do inhabit vacant blinds. And even more common are red wasps, aggressive little devils with a really bad sting. Be cautious and check out the blind when entering one in the summer. DON'T LET BAD WEATHER KEEP YOU OFF THE LAKE---January has proved to be the best month of the year for taking trophy crappie in 2005. Local fishermen bundled up and took some boxes of fish home averaging nearly two pounds per fish. And when the wind blows, no lake offers more wind protected areas than Reelfoot, especially the upper blue basin. Although not recommended except for the most experienced, local fishermen have taken nice catches out of the lake on days when the wind approached 30 miles per hour, just by fishing the ditches and heavy timber. LISTEN UP---Dock operators, resort owners and persons selling bait around the lake are a valuable source of information. Fishermen like to talk and their near inability to keep a secret can lead to some key tips. Are they biting in open water? How deep? Have the fish moved in? 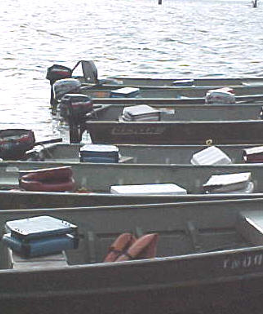 All of these are valuable tips and can be picked up around the lake. And Reelfoot natives are very helpful with information. They want their guest to return. SUNDAYS AND THURSDAYS ARE LOW USE FISHING DAYS---During March, April and May-the busy season here-the lake can attract so many fishermen that congestion can be a problem, especially on a rare clear, calm spring day. Locals have long know the Sunday and Thursdays are "turnover days" for many resorts offering packages and the lake can be almost deserted. many locals, who can fish pretty much when they please, take advantage of those days. FISH SHALLOW, FISH DEEP---Even in the dead of winter, don't be afraid to fish shallow, even in the deepest parts of the lake. 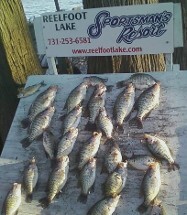 A winter warm spell can put slab crappie almost on the surface. In the summer, when the temps often hit 95º and higher, fish can retreat to the deepest sections of the lake. BAIT IS IMPORTANT---For bass fishermen, the ubiquitous spinner bait has been effective at Reelfoot for decades. Worms and crank baits take their share of fish. Minnows remain the staple for crappie but jigs tipped with minnows have caught a lot of slab fish. For bream, the reliable cricket and cork remain a staple but Grizzly jigs topped with waxworms have become extremely popular and very, very successful. HAVE FUN---Fishing is not a business, unless you are a guide. Take a break, observe the beauty around you. Take your time. Visitors will find things pretty laid back here at Reelfoot--that is the way we like it.